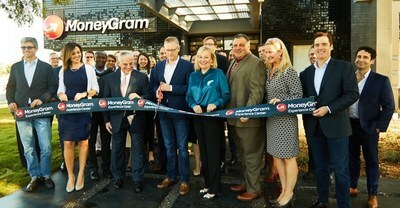 DALLAS, Sept. 27, 2018 /PRNewswire/ -- MoneyGram (NASDAQ: MGI) today announced the grand opening of the MoneyGram Experience Center in Dallas. The store showcases cutting-edge technologies, including biometric facial recognition and virtual reality, to offer customers a quick, easy and unique digital transaction experience. The Experience Center streamlines the way consumers transfer and send money in the digital age. "We are excited to open the MoneyGram Experience Center to offer our customers a new and advanced money transfer experience," said Alex Homes, MoneyGram's Chairman and CEO. "MoneyGram is building the future digital payments ecosystem while also reimagining what the money transfer experience can be for our customers whether they are transacting in cash or on a digital platform. We are at the forefront of emerging digital transaction trends, creating new, convenient ways to send money to family and friends around the globe and our Experience Center will bring these innovations to our customers." The Experience Center is also home to MoneyGram's first-ever Innovation Lab. It features new products still in development and allows customers to test services and technologies before they are introduced to the broader market. This is a unique opportunity for MoneyGram to both engage with consumers in real time and familiarize the public with the ever-evolving money transfer and payment services industry. While the Experience Center boasts many new digital transaction options, consumers can also transact in cash which is still a vital need for many of MoneyGram's customers. MoneyGram's ability to utilize cash and digital platforms creates a true omnichannel experience that differentiates the company from many of its competitors.